We’ve run a few articles on the topic of sleep over the past few months, so it was no surprise when the editors at Cyberparent recently asked me how I currently rated my at-home sleep experience. Fortunately for me, I’ve never really had too many issues when it comes to getting to sleep at night. While stress absolutely creates the occasional night of tossing and turning, all in all sleep has been my friend. That being said, when I was asked if I wanted to take a new pair of king-sized sheets for a spin compliments of California Design Den, how could I say no? A week later my package arrived! Inside, a set of light grey, Everyday Comfort – 400 Thread Count – 100% Cotton Sateen Sheets. 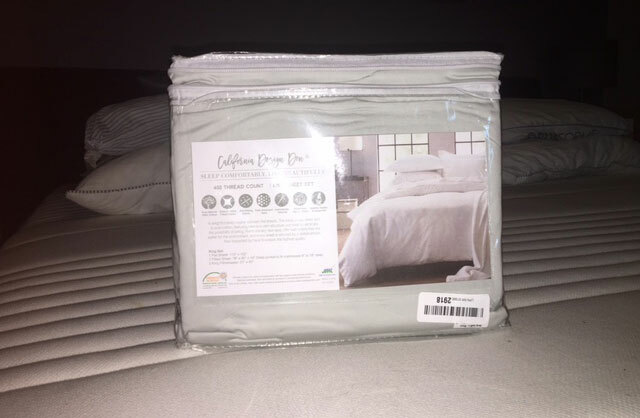 The packaging was professional, and consistent with what I would expect when buying bedding from any run of the mill department store – nothing fancy, nothing shoddy – just right. Unzipping the top of the packaging, I removed a fitted king size sheet, a top sheet, and two kind sized pillowcases. Of course, I immediately rubbed the material between my fingers to get a sense of just how soft these sheets were. Honestly, pretty average. Compared to the sheets I had been using, I didn’t detect an immediate ‘Holy cow these are soft’ feeling – but then again, these are the ‘everyday comfort’ variety. California Design Den also offers a Performance Blend Superior and even an Ultra-luxe offering 700 and 1000 thread counts respectively – double that of the everyday comfort variety. So, re-calibrating my expectations, I would say my first impressions are that these sheets seemed reasonably soft considering their price point. As my wife & I stripped the old sheets, and fitted the new ones, we both commented on how nicely they fit around our IKEA MORGEDAL King sized mattress. 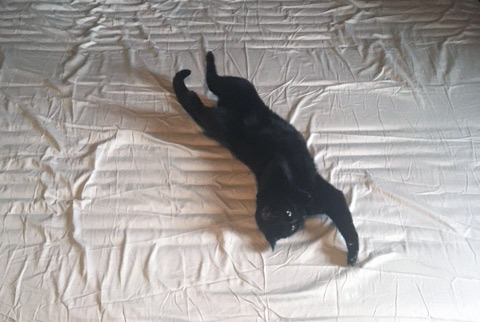 Tight, but not difficult to place, the fitted sheet stretched perfectly with minimal effort. It also had a nice ‘sheen’ to it (Sateen? ), and Maple (pictured above) really couldn’t help but to acquaint herself. The top sheet (predictably) also covered our mattress nicely, and as an added bonus the ‘hue’ of the grey matched the tone of our bedroom nicely. On to the actual sleep test! Climbing in for the first time, I did notice that likely due to the Sateen characteristics, I ‘slid’ down into position quite easily. Running my feet and legs around under the covers, they did seem to have a pleasant characteristic to them. All in all, however, I was not overly blown away – but night 2 got better! The second night the sheets seemed to ‘break-in’, and I definitely felt as though they were noticeably softer. Reaaaaal soft, in fact, and I found myself once again running my feet and legs around but this time with a far superior tactile sensation. Look, I’ll be frank: I had high expectations for these sheets, but in the end this is a $40 set of King-sized sheets that packs some pretty good bang for the buck. While I can’t speak to the overall longevity, they appear well constructed and definitely seem to have a leg up when doing some quick comparisons online for price vs. value. They’re comfier than the sheets we had on previously and I’d expect they’ll continue to get even softer with a few washes and some UV exposure. Interested? Check ’em out here.